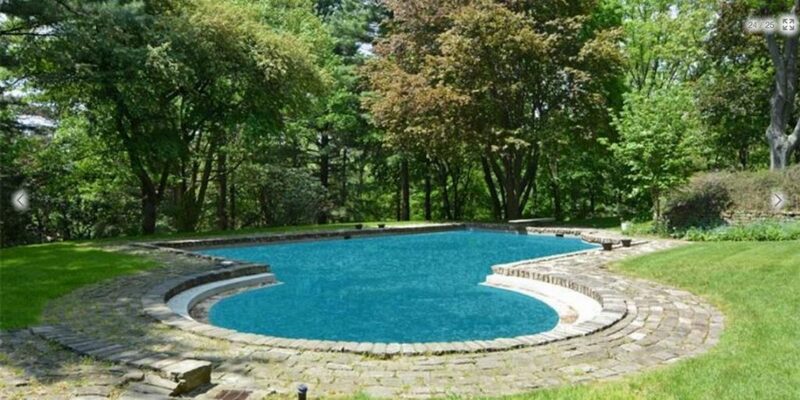 The peaceful pool in the backyard of this home is just one of its many amazing features! A stately brick provincial, this home has an outstanding open floor plan with hardwood floors throughout. Skylights and glass doors lead onto the deck overlooking a heated in-ground pool. Read your favorite book in the shade or go for a swim in the privacy of your own backyard, surrounded by tall trees. This is a fabulous property in a quiet location. Go for a relaxing swim before work each morning. 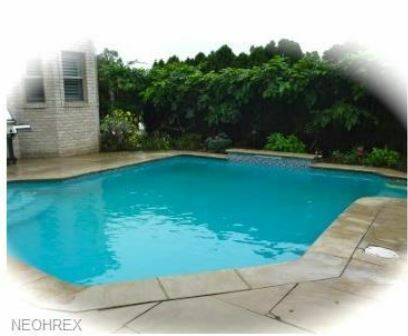 Sit poolside in the summertime and enjoy a professionally landscaped backyard. Custom paths and steps are throughout the expansive 4-acre lot. A deck and patio make this Home of Distinction enviable! 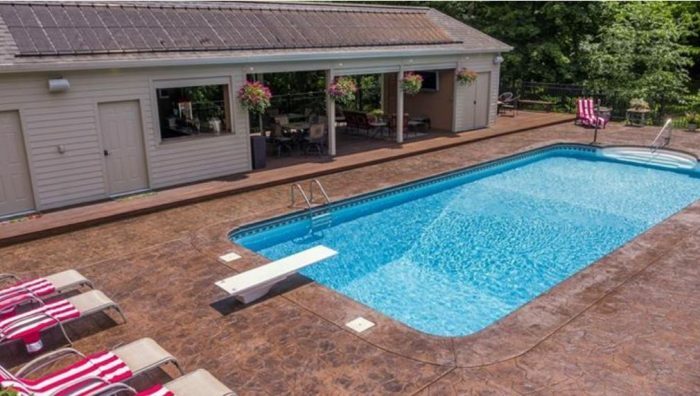 From a basement entertainment center to a beautiful outdoor pool, this home has everything! Designed with great care, the backyard, patio and pool are amazing Soak up the sun poolside, then use the diving board to jump in when you want to cool off. This home is the realization of all your wildest dreams come true! Experience unique Lake Erie living at this unique Home of Distinction! Go for a swim in the amazing in-ground pool or relax in the hot tub. Evenings can be spent around the fire pit and the best news is that it’s all located right by the outstanding Turtle Bay sandy beach. Enjoy private luxury in this home, located on three beautifully landscaped acres. A rarity in Ohio, this home has year-round fun with an indoor pool! On days where you don’t want to swim, stroll the gardens or play some tennis. You’ll appreciate this spectacular all brick contemporary custom home. Not only does it boast a beautiful backyard pool, but it also has easy access to hiking trails in the surrounding 24-acre nature preserve! The peaceful pool at this property is only the beginning of its charm. Exceptional quality and amenities are throughout this fabulous custom-built home. The lower level media room has sliding glass doors that open to the pool area. Imagine yourself taking a dive off the plank into this amazing in-ground pool! When you’re done going for a swim, enjoy the pool house, complete with kitchen, changing room, powder room and seating area. Then, watch a movie on the outdoor large screen television. 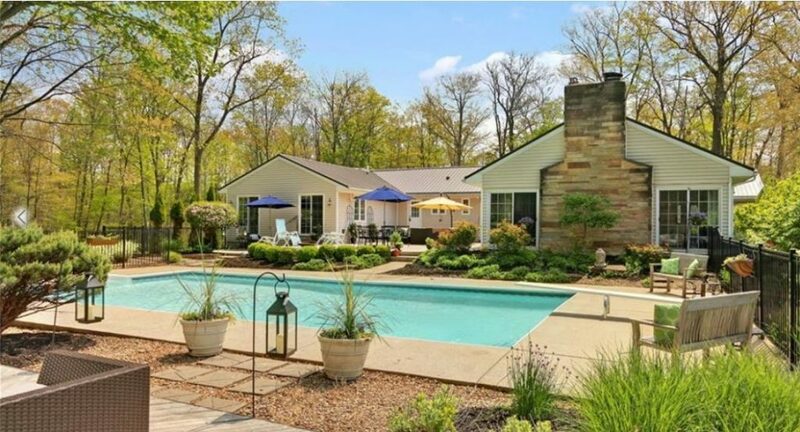 Located in North Chagrin, this updated ranch is a dream come true. Cozy yet sophisticated, it has many important upgrades including a new kitchen. Outdoors, the home boasts multiple patio areas surrounding a fenced in pool. Terrific views on over 3 acres! Country living in one of Cleveland’s premiere suburbs! 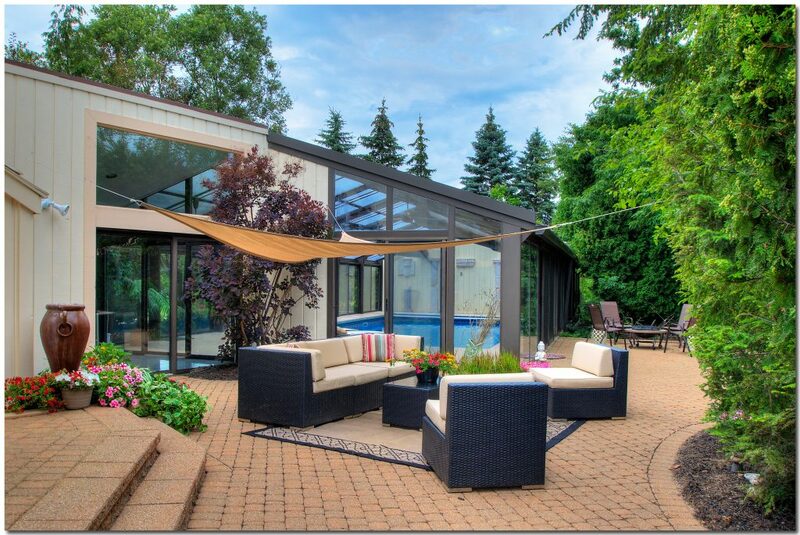 Two sides of this peaceful glasshouse pool open onto the patio, complete with areas for dining or just relaxing. The deck wraps around the home with a private hot tub and seating area off the master bedroom. Best of all, this home is perched on a hill, well-landscaped and offers the upmost privacy. A custom John Hobart Miller, nestled on a tree lined cul-de-sac, this home is the definition of serene! The family room opens into a multi-level deck overlooking part of the 1.8 acre property. The beautiful pool is perfect for relaxing during a lazy, summer afternoon. Don’t miss out on this outstanding home and its peaceful pool! With stunning views of the Ohio River, this Home of Distinction is truly a unique treasure. The exterior features a wrap-around deck with sensational views of the grounds, pool and river. 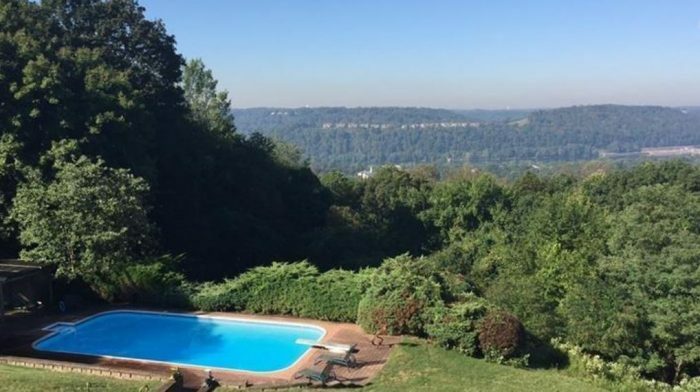 Private and serene, this Sewickley home has the best pool for cooling off on a steaming summer afternoon. What a gorgeous concept….I ready for a dip!